Holiday Ham GTA | Home | The Honey Glazed Ham Co. Ltd. Holidays Are Here… ORDER NOW! Enhance your meal with the sweet smoky flavour of our honey glazed ham. For more than 30 years, our family-run company, The Honey Glazed Ham Co. Ltd., has served North American-style, made-to-order spiral sliced holiday ham throughout GTA to Canadian families. Since 1985, we have worked with superior pork and an intensive seven-day process to produce the best mouth-watering, delicious ham you can buy that's low in salt and water — and a breeze to store and serve! It takes a long time, a lot of care, and — of course — a secret recipe. Each honey glazed ham is made from hand-picked, grain-fed Ontario Pork, carefully trimmed and naturally smoked to perfection. Every ham is cured over a mixture of hickory and applewood chips for up to 30 hours. During this time, the unmistakable natural smoke flavour permeates every morsel of the ham. In total, the process takes about a week, yielding without fail a perfect, fully cooked, delectable ham that is low in sodium, phosphate, and fat, with a minus .05% water content. In comparison, most commercial hams are artificially smoked and contain 20-40% water. Each ham is then spiral sliced on our patented Spiral Slicing machine: they go around and around the bone from end to end in one continuous slice. Next, we pour a special mixture over the ham, made of pure honey and our secret honey buds, along with carefully blended herbs and spices. We then let the special mixture seep into the ham right down to the bone. Finally, as a unique final touch, we fire glaze the ham to form a delicious and decorative crusty coating, which makes each and every honey glazed ham simply irresistible — to both the eye and the palate. Find a local distributor in your area, with locations throughout Toronto and the GTA! Want Something to Go with Our Delicious Ham? To add to The Honey Glazed Ham Co. Ltd.’s delicious hams, we offer a wide variety of different meats, such as smoked turkey, ham and garlic kielbasa, and pork belly/bacon, as well as numerous sides and desserts for you to choose from. No matter what event you’re planning on serving, whether it’s a corporate meeting, a party, a wedding, or a bar/bat mitzvah, we have all the meat and sides you’ll ever need to keep your group’s appetite and tastes satisfied. Just visit us to pick up your desired meats and sides, have us drop them off at your specific location, or let us cater your event directly! Visit our Facebook page to keep in touch with The Honey Glazed Ham Co. Ltd. You’ll get to see tasty imagery and videos — and if you want, you can even post a review of your time with us! 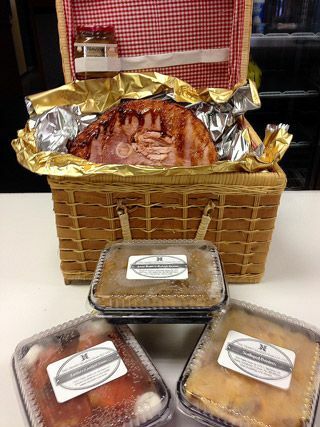 We offer several different meats to add to your meal, from smoked turkey to ham and garlic kielbasa. You can have the ultimate comfort food when you pair our ham with Big Daddy’s sides and desserts. If your friend is a foody, but you don’t know what to get them, consider giving them one of our hams.